A slide providing key details of a new high-end gaming monitor has been shared online. Apparently, AOC is working on a pair of new flagship displays dubbed the AOC Agon 353 series, as part of its third generation of gaming monitors. Headling qualities of this monitor are its 35-inch curved display, 1440p ultra-wide resolution, max 200Hz refresh rate, VESA DisplayHDR 1000 certification, and 100 per cent DCI-P3 colour gamut. 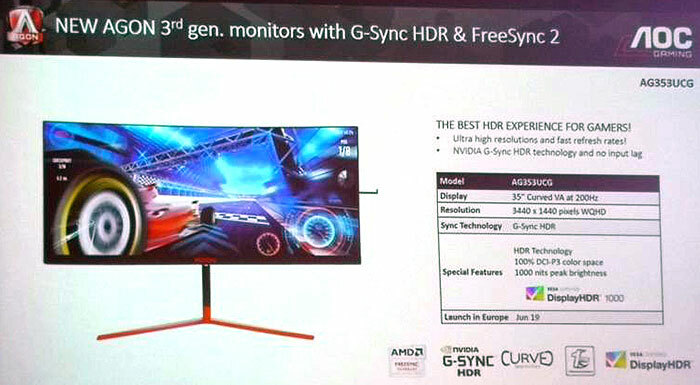 The series will be made available with buyers choosing between FreeSync 2 HDR and G-Sync HDR variable sync technologies. AOC's new AG353-series are based around a 35-inch curved VA panel with 3440 x 1440 pixels resolution, with 200Hz max refresh rate, 1000nits peak brightness in HDR mode (DisplayHDR 1000 certified), 1ms MTRT response time (4ms GtG), a 2000:1 contrast ratio, and cover the full DCI-P3 colour space. Gamers will have the choice between an AOC Agon AG353 featuring AMD FreeSync 2 HDR, or Nvidia G-Sync HDR and the monitors will have different suffixes appended when they hit the market. Another difference, according to AnandTech, will be that the G-Sync model will feature "a 512-zone Full Array Local Dimming backlight". Other monitor specs, shared by TFT Central include; support for HDMI 2.0 and DisplayPort 1.4 connections, 2x 8W speakers, and a built-in four port USB 3.1 (5Gbps) hub. 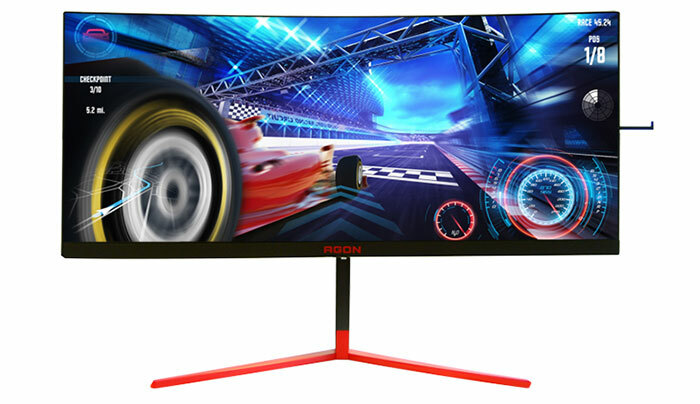 The AOC Agon 35-Inch Curved HDR 200Hz gaming monitor is expected to arrive in Euope in June 2019. Unfortunately we don't have any pricing information at this time.